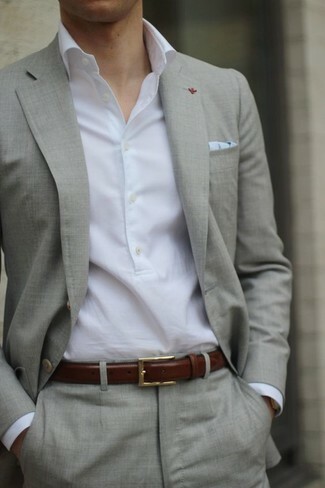 A resounding yes to this city casual combo of a grey cardigan and a Brooks Brothers brown leather belt! For something more on the classier side to round off this look, complement your look with a pair of tan suede derby shoes. 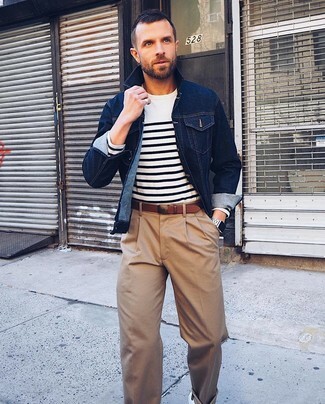 A white crew-neck t-shirt and a Brooks Brothers Plaque Buckle Calfskin Leather Belt from Brooks Brothers are wonderful menswear must-haves that will integrate really well within your day-to-day casual fashion mix. 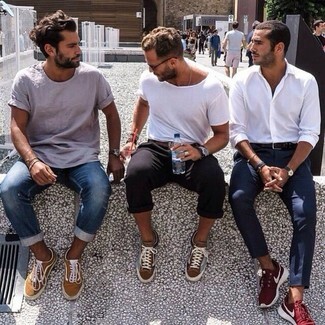 Introduce brown low top sneakers to the equation to kick things up to the next level. Consider pairing a beige suit with a Brooks Brothers Plaque Buckle Calfskin Leather Belt from Brooks Brothers for a sharp, laid-back outfit. 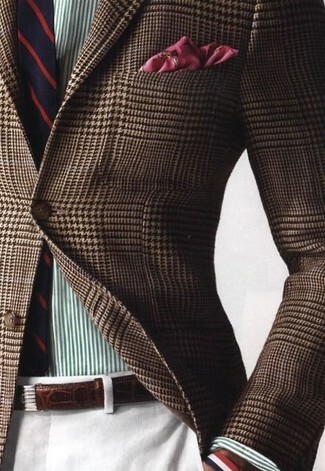 This pairing of a brown houndstooth blazer and a brown leather belt is uber stylish and provides instant cool. If you prefer relaxed dressing when it comes to fashion, you'll love this on-trend pairing of a grey plaid blazer and a brown leather belt. You could perhaps get a little creative in the shoe department and lift up your getup with brown leather loafers. If you gravitate towards city casual style, why not take this combo of a beige blazer and a brown leather belt for a walk? Go for a straightforward but at the same time laid-back and cool option combining a light blue plaid long sleeve shirt and a Brooks Brothers Plaque Buckle Calfskin Leather Belt. 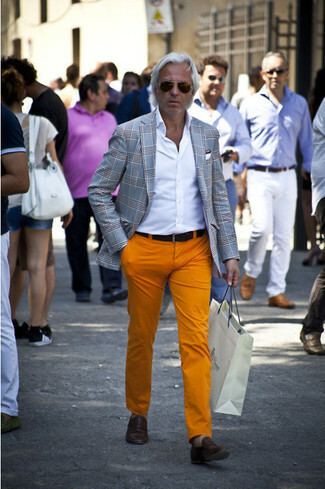 You'll be surprised at how easy it is for any gent to get dressed like this. Just a navy denim jacket and a Brooks Brothers brown leather belt. 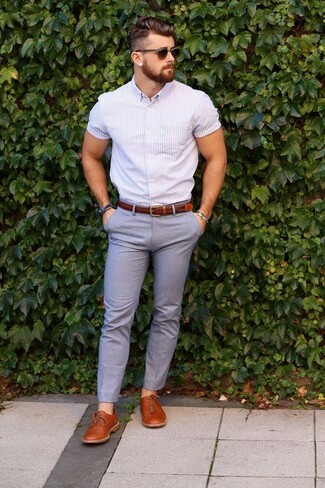 Complete this outfit with white leather low top sneakers to make the outfit a bit more polished. Consider wearing a light violet vertical striped short sleeve shirt and a brown leather belt if you wish to look casual and cool without making too much effort. If you want to feel a bit more polished now, throw tobacco leather derby shoes in the mix.